It's been said over and over again, Noncommissioned officers, or NCOs, are the backbone of the Air Force. The organization's success or failure, strengths or weaknesses, can be directly related to the effectiveness of its NCOs. The Air Force enlisted force is comprised of distinct and separate ranks. Each correlates to increased levels of training, education, technical competence, experience, leadership, and managerial responsibilities. In 1977, the enlisted force structure was reorganized into the following three tiers. The top three ranks of the enlisted force structure are a master sergeant, senior master sergeant, and chief master sergeant. Within this tier, personnel transition from craftsmen and supervisors to leadership and managerial positions. SNCOs exercise leadership and manage resources under their control. This tier is where technical sergeants and staff sergeants transition from workers and journeymen to craftsman and supervisory positions as they develop military leadership skills and attend Professional Military Education (PME). This tier consists of airman basic, airman, airman first class, and senior airman. It is the initial tier of the three-tier enlisted force structure. As a member progresses from airman basic to senior airman, he or she acquires the discipline, skills, and PME necessary to become eligible for NCO status. 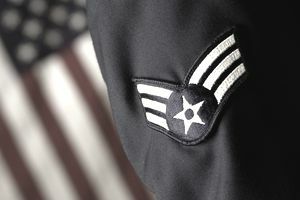 The rank of CMSgt is the highest Air Force enlisted rank, with the exception of the Chief Master Sergeant of the Air Force. CMSgts are superintendents and managers, and they provide senior enlisted leadership. They are assigned chief enlisted manager (CEM) codes upon selection to CMSgt and may fill any managerial-level position and perform all duties not prohibited by law or directive. CMSgts are advisors and enlisted force managers. SMSgts perform as superintendents or managers. Broad management skills are essential to exercise the responsibilities of the higher leadership positions in which SMSgts serve. The 9-skill level "Superintendent" is awarded when SMSgts sew on E-8. SMSgts should continue their professional development to become viable candidates for unique assignment opportunities and future promotion selection consideration to CMSgt. MSgts function primarily in craftsman and supervisory positions as they prepare for more advanced leadership positions. MSgts hold a 7-skill level. This rank carries significantly increased responsibilities and requires a broad technical and managerial perspective. MSgt selects should enroll in and complete the AFSNCOA correspondence course. TSgts hold a 7-skill level and are qualified to perform highly complex technical duties in addition to providing supervision. They are responsible for the career development of all enlisted personnel under their supervision. They must obtain maximum performance from each subordinate and ensure the product or service is of the quality necessary for total mission effectiveness. TSgts will continuously strive to broaden and perfect their professional expertise and supervisory techniques. SSgts are primarily craftsmen with certain NCO supervisory responsibilities. They may hold either a 5- (journeyman) or 7- (craftsman) skill level. SSgts must complete their 7-skill level through upgrade training to be promoted to TSgt. SSgt supervisory duties differ from those of the TSgt only in scope and span of control. SSgts strive for greater supervisory competence as they function in their technical capacity. They are responsible for their subordinates and the effective accomplishment of assigned tasks. They ensure the proper and effective use of personnel and material. SSgts must continuously strive to further their development as technicians and supervisors. A SrA is in a transition period from journeyman to NCO. Development of supervisory and leadership skills through PME and individual study is essential. All SrA should conduct themselves in a manner commensurate with established standards, thereby asserting a positive influence on other airmen. The SrA must, at all times, present the image of competence, integrity, and pride. An A1C must comply with Air Force standards and be a role model for subordinates. They are expected to devote efforts to mastering the necessary skills in the new career fields. An Amn, while still primarily an apprentice, is expected to understand and conform to military standards. The AB is an apprentice who is acquiring and demonstrating knowledge of military customs, courtesies, traditions, and Air Force standards while learning both military and technical skills. The official term of address is airman basic or airman. Responsibility and accountability increase commensurate with rank. Within each rank, responsibility for leading rests on the individual who is senior in rank. Information derived from AFPAM 36-2241 Vol I, and AFMPC.